“Church’s decision is like someone putting a gun on the Government’s head” - Prime Minister Tuilaepa. Well, it’s Sunday again today, so perhaps Prime Minister, Tuilaepa Sailele Malielegaoi, should slow down on his plan to tax church ministers in Samoa. Perhaps he should sit down and rethink his decision, and yes, much harder this time, if he would. From what we’ve discovered, there are 195,979 members of all churches in Samoa. Of that number, 56,818 are members of the Congregational Christian Church of Samoa (C.C.C.S. ), who has 201 churches. The problem though is that, except for the leadership of the C.C.C.S. who have made known their determined opposition against the tax that Tuilaepa’s government, has already passed into law, the rest of the churches are silent. Indeed, they have yet to make public their stand on the matter, except for the Chairman of the National Council of Churches, Deacon Leaupepe Kasiano Leaupepe, who has apparently distanced himself from the dispute. Deacon Leaupepe added: “The church has come up with a decision and therefore I am not going to interfere. What the church’s decision is though he did not say. He also said that at that time, the relevant notice would be sent to all Church Ministers in Samoa, advising them to register and present those documents that are required under the Income Tax Act 2012 under section 59. The Bill was apparently approved and signed into law on June 2017, and it was to be implemented in January 2018, with six months of public awareness. And if a Church Minister wants to know what the penalties are, he would have to get a copy of the Tax Administration Act 2012 under section 12. Those who do not comply with the law are penalized, the law said. The penalties range from $100 to $300 and the maximum one is $500 for failing to file the document. Still, the question that is now bursting to reveal itself, is: What exactly motivated Prime Minister Tuilaepa, and his Minister of Revenue, Tialavea, to tax church ministers now, when they could have done so many years ago. And now that it’s been revealed that the government is planning to tax the ministers of all churches, what about their members? We know well enough that the majority of them are unemployed, therefore their families who are struggling in poverty are barely making ends meet, and now with the children’s own school needs to be taken care of, was Prime Minister Tuilaepa’s government going to tax them too? Now the question that would just not go away is: Is the government of Prime Minister Tuilaepa Sailele Malielegaoi broke? If so, why? What happened? As for the law to tax church ministers, that is apparently causing Tuilaepa much anger and stress, his Minister of Revenue, Tialavea Tionisio Hunt, would not comment when he was asked. He said he would not comment on whether the Government would enforce the law by 30 June 2018, now that the decision by the Church had been made public. The “decision” he was referring to, was first made during the Church’s Annual Convention, in 2017. And according to the Church’s General Secretary, Reverend Vavatau Taufao, that decision has remained the same today. Later though, Tuilaepa, confirmed that they have yet to meet with the leadership of the Church, and added that the meeting was likely to take place next week. Reverend Vavatau Taufao said: “Keep in mind that in the C.C.C.S., there is no such thing as one’s discretion. That is why I have pride in my church because we practice the true meaning of democracy. 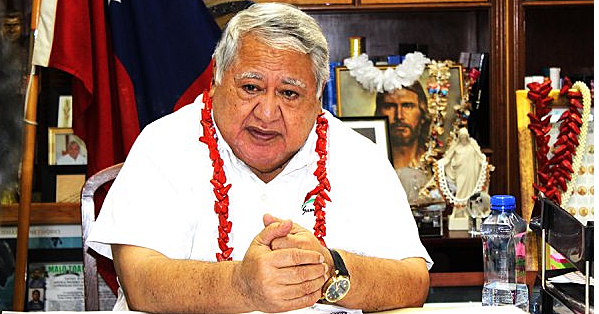 In Parliament though, Prime Minister Tuilaepa compared the decision by the Congregational Christian Church of Samoa to someone putting a gun on the Government’s head. He used Parliamentary privilege to send a message to the Church telling it that Parliament is the Supreme Law making body of the land and no one can derail its decisions. He also reminded that the law has been passed and there is nothing anyone can do about it any more.